Horseshoe crabs have been crawling on our planet for nearly half a billion years, yet for all the brains we evolved in our measly half-million-year existence, we never did figure out what they actually are. Now a genetic study published this weekend in the journal of Systematic Biology finds evidence for the theory first postulated in the year 1881: the horseshoe crab is not a crab after all. It is a sister group to Ricinulei, the hooded tick spider. In short, the inference of the genetic study is that the horseshoe crab is an aquatic spider, report University of Wisconsin-Madison evolutionary biologists Jesús Ballesteros and Prof. Prashant Sharma. This is an ancient species. The earliest-known horseshoe crab dates back 450 million years, predating the first dinosaurs by a couple of hundred million years. Unlike classic arachnids, horseshoe crabs have ten legs and ten eyes (not eight and eight), plus light receptors on their spiky tails. They also have blood – and, ending a 140-year quarrel, turn out to be relatives of the spider after all, not the crab. The earliest spider fossil goes back "just" 400 million years, to the Devonian Period. Bizarrely, the classification of ye olde horseshoe crab tarried because scientists disbelieved the evidence before their own eyes for years, effectively mistrusting themselves and their results. “Scientists assumed it was an error, that there was a problem with the data,” Ballesteros explains. Sad. Thus scientists rejected previous genetic work indicating that the animal was not a crustacean but an arachnid – like spiders, scorpions, mites, ticks and lesser-known creatures such as vinegaroons (named for their acetic emission when peeved. Some call them whip scorpions, though they’re not scorpions. They look like a cross between a spider and a scorpion with a slim tail). In other words, the latest study means we have to wedge the horseshoe crab into the early evolutionary tree of the arachnidae, which somewhat tweaks our understanding of arthropod evolution – a group encompassing insects, crustaceans and our friends the spider, scorpion and that lot. Massive and extremely painstaking genetic analyses led the team to conclude with “a high degree of confidence” that horseshoe crabs do indeed belong to the arachnid family. Anybody who’s ever seen a horseshoe crab upside down will not be shocked out of his skull at this arachnid association. They look rather like huge spiders with a shell and alarming, if harmless, tail. They don’t have crabby antennae or that grinding jaw: they have spidery chelicerae (those tiny “arms” that move food into the mouth, which sci-fi writers have adopted for a host of hostile alien images). But some zoologists have suspected the name “horseshoe crab” to be a misnomer since evolutionary biologist E. Ray Lankester decided they weren’t true crustaceans and classified them in a group more similar to spiders and scorpions almost 140 years ago. It explains a lot. A bit like the platypus, an ancient monotreme that has vestigial elements of reptiles, birds and mammals, the horseshoe crab possesses physical characteristics typical of a host of fellow arthropods (which as we said encompasses insects, crustaceans etc.). They have hard shells like crabs. But they are the only sea creature with “book gills,” seemingly a precursor of the “book lungs” spiders and scorpions use to breathe on land. It also explains why, in contrast to crab and lobster and even the abalone, they taste terrible. Ballesteros compared complete genomes of three out of the four living horseshoe crab species against the genetic sequences of 50 arthropod species, including water fleas and land-based centipedes and daddy longlegs, spiders which have the attractive attribute of forming giant clusters. Why had the genetic information been so hard to decipher? The fossil record and genetic evidence both indicate that hundreds of millions of years ago, arthropod evolution had been explosive and fast – “convoluting their relationships to one another,” explain Ballesteros and Sharma. The horseshoe crab’s ancestors even survived more than one mass extinction. But the anthropogenic extinction in process could change that. 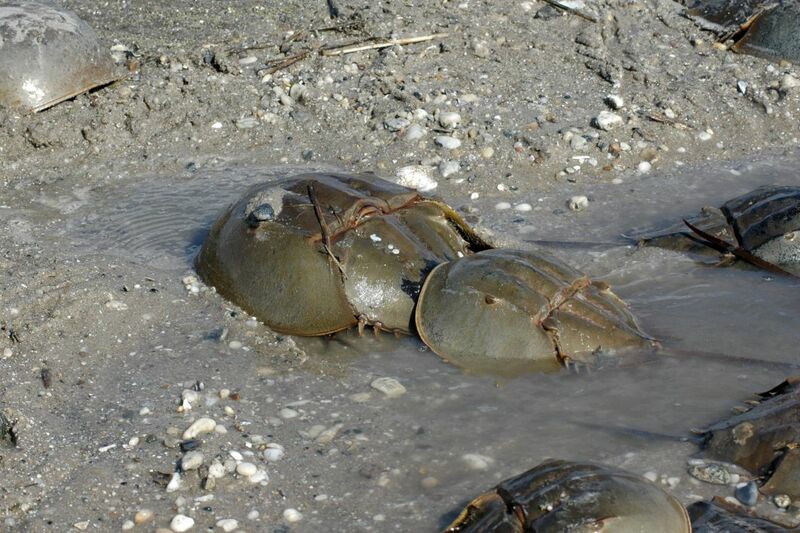 Horseshoe crab numbers have been dwindling worldwide. The acidification of the oceans is as bad for them as for all arthropods, and on top of that, they’re being harvested to extinction – by pharmaceutical and makeup companies. The poor “crabs” are being caught and drained of their blue blood, which has special clotting and bacterial-detection properties; their shells are used in a host of creams. 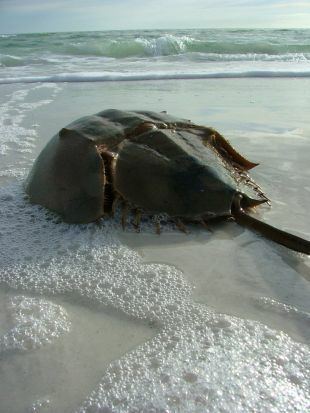 Just this week the state of Florida asked its citizens to keep an eye out for mating horseshoe crabs, because “breeding appears to have stopped at some historical locations,” Florida Today quoted concerned scientists – whether because of over-harvesting or sheer pollution. So light has been shed on horseshoe crab antecedents, but before sniffing at the doubt that remain - note that we don’t know exactly who our ancestor was either. Yes, a monkey, but which? When? Where? Even when climbing up the hominin branch tree of the primate tree, our doubts remain all the way to our closest prehistoric relatives, Neanderthal and Denisovan. We still can’t agree on whether these were separate species or a beetle-browed variant of the very species that is us. So science deserves a break on the precise ascent up the arthropod tree and the next time you see one of the surviving four horseshoe crab species on a beach, thank your lucky stars that venom, and clustering, seems to have developed later along that branch.